On the 5th of December 2013, Tigress Julie passed away at Tiger Canyons in South Africa. At the age of 14 years old, Julie's kidneys had ceased to function. All the injuries Julie sustained in the fight with Shadow had healed. 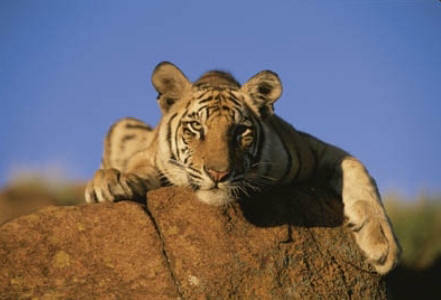 Tigress Julie was born in the USA in September 1999. As a young cub, Julie and her brother Ron moved to Bowmanville Zoo in Canada. I would like to thank Michael and Wendy Hackenberger, who gave me two priceless gifts, Ron and Julie. These two tigers became the founding tigers of the ex-situ conservation experiment, which started at Tiger Canyons thirteen years ago. Tigress Julie was one of the most widely traveled tigers in the history of tiger conservation. Born in the USA, she moved to Canada and then flew to South Africa, landing at Oliver Tambo Airport. From there she went to the North West Province and then on to Phinda Game Reserve in Kwazulu Natal. From Phinda, she flew to Hunters Moon in the Northern Cape and then transferred across the Van der Kloof Lake into the Free State Province to Tiger Canyons. With the help of Dave Salmoni and Gillian van Houten, I set about "teaching" Julie to hunt. During Julie's lifetime I did over 300 hunts with her on foot. Many of these were successful. During her life, Tigress Julie caught and killed 14 different species of prey, including catching large barbel in the Van der Kloof Lake. On one occasion, she caught an adult blue wildebeest weighing 280 kilograms. Although the wildebeest pounded her into the rocks, after a 40 minute struggle, Julie subdued the wildebeest and throttled it. In one hunt she ran down an ostrich at a speed in excess of 40mph. In an extraordinary experiment, Julie allowed me to introduce the lion cub Savannah into her first litter (Savannah would later prove that the hunting style of lions and tigers is genetically coded). On many occasions, Tigress Julie allowed me to baby sit the cubs while she searched for new den sites (Julie moved the cubs every 6 to 7 days to a new den). In a huge thunderstorm, while searching for a cub in the tall grass, Julie moved 30 metres out of her way to inform me that she had already found the cub (Julie chuffed me through her nostrils while holding the drenched cub in her jaws). Tigress Julie abandoned her second litter of cubs (The reasons why she abandoned them are still not clear). These cubs, Sunderban, Zaria and Shine were hand raised. Walking every day with the cubs and swimming in lakes and rivers, remains one of the greatest years of my life. Tigress Julie's third litter was a litter of 5 of which 4 survived. These cubs, Mahindra, Ussuri, Indira and Tibo (Tibo is a white tigress), have all dispersed and become extremely successful wild tigers. In November of 2013, Julie became a grandmother when Ussuri her daughter, gave birth to cubs. In 2012, at the age of 13 years, Julie cleared a 3.2 metre fence, an incredible athletic feat. After killing 14 sheep, I walked Julie back 3 kilometers to Tiger Canyons using my belt as a leash (Julie had not been on a leash for 8 years). During the devastating court case which dragged on for 11 years, it was Julie I went to for support and inspiration. Sitting in silence with her, not filming, not photographing, not speaking, were some of the most calming moments of my life. The lies and deceit from the humans in the court case, contrasted vividly with Julie's honesty and directness. I vowed that from this time on, I would simplify my life and live by the laws of nature, rather than the laws of people. Tigress Julie is known throughout the world. She was the star of the film "Living with Tigers" which showed in 165 countries and the film "Tiger Man of Africa" which broadcast to 180 countries worldwide. Conservatively, a half a million pictures were taken of this incredible tigress, earning her the nickname "Princess Diana". Tigress Julie's life story is being written in a book called "Icon Cats", to be published in 2014. Julie's legacy is strong. She is survived by Shy Boy and Tiger Boy from her first litter (Shy Boy and Tiger Boy were Savannah the lioness's litter mates). From her second litter, Sunderban and Zaria survive (Shine was killed in an attempted theft for a canned tiger hunt. See Newsletter No. 38). From Julie's third litter, Mahindra, Indira, Tibo and Ussuri all survive (Ussuri has produced her first litter of cubs). There is not much else to say except that the relationship I had with Tigress Julie was profound. It changed and enriched my life enormously. It took me to places and in directions I could never have imagined. Some greater force gifted Julie to me and the privilege of knowing her was life changing. Her passing has affected me deeply and I will take a long time to recover. It is fitting that Tigress Julie died on the same day as Nelson Mandela. Both were giants, Mandiba in the political world, Tigress Julie in the fight to save endangered species. Julie was the ultimate ambassador for her species. If you would like to make a donation to the "Savannah Fund" which has been renamed the "Tigress Julie Fund", below are the details. As told in my book "Nine Lives", I was with Nelson Mandela at Londolozi when the AWB drove the vehicles through the Trade Centre windows in an attempt to disrupt the peace talks. I was able to see Madiba under great stress at one of the most critical times in South Africa's history. South Africans were fortunate to have Madiba at this crucial moment. Without his leadership and calm, we would have been plunged into a devastating civil war. To the present leadership I say, we need to go into the future with the standards, ideals and values that Madiba has set us. This is our challenge! The standard copy of "In the Jaws of the Tiger" is out. We will begin posting next week. The leather bound is in production and will be out shortly. The two judges of the photo competition Marsel van Oosten and Daniella Sibbing, are in the Arctic. However, they will announce the winner before Christmas. Thank you to all who entered and good luck. We join you in your sorrow of losing Tigress Julie. Although we only had the pleasure of her company for one day it was a day we will never forget. Each time we look at the many photos taken on that day the memories come flooding back. All our friends have shared our memories with us making our visit to Tiger Canyons very special indeed. May HE smile down on you and your efforts to save these awesome cats. May Christmas and the coming New Year be everything you and your family have wished for. Terry and Heather de Souza. This made me cry, for you and for Julie. I feel for your deep loss, she was such a friend and companion. It must have been excruciating to watch her suffer. I have a friend who is an animal communicator and she tells me cats are more pragmatic about death than we are. I always hope this is true. I send you my love and condolences and will also mourn Julie's passing. It is one of the great saddneses that the animals in our care do not live as long as we do. To loose good friends over and over again is devastating. Take time to heal from your loss of Julie. The death of Mr Mandela was expected: at 95 years he had a great innings and his achievements are a matter of record. I also know that he and Enos Mbusa went to Londolozi after Mr Mandela’s release from Robben Island. This loss will I am sure be keenly felt by you all. Now I have just read the news regarding Julie and wanted to commiserate with JV, you and the team I know just how much that animal meant to John and we were privileged to have met her. Iain of course is particularly sad, we were looking forward to renewing our acquaintance with her in February. A sad week. But both have lasting legacies that will live on. Our sympathies to all at the Tiger Sanctuary. We remember with fondness our special time with Julie. What a wonderful relationship the two of you had. What a wonderful legacy, with your help, she created. Two great spirits passed away on the same day. 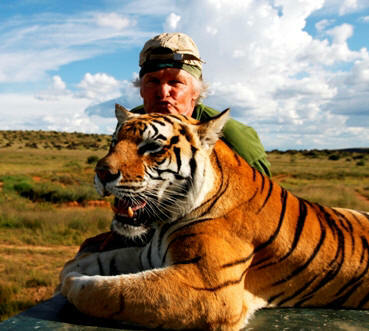 You must be devastated - to have had a tigress like Julie and to chuff her like you did with such a great understanding between you was so special - I was looking forward to meeting her next year. Can't stop crying. Very nice story. Thank you John. It's very sad to loose a friend so dear. We all thinking of you. Suzanne and I wish to express our sincere condolences on the passing of Julie. Although our exposure to her was brief and at a desperate time in her life it was clear to us that there was a deep bond, love and admiration between you both and we are quite sure that you are saddened deeply by her passing. However, like what is happening with Nelson Mandela's transition, we must celebrate how profoundly she has impacted many lives and one can only guess about the true impacts her life will have on the future of mankind. We are hopeful that the world is making a turn for the better when it comes to being stewards of nature and all that is in it. We truly want to thank you for the day we spent with you as it was the highlight of our trip to South Africa and has already had an impact on how we see the world and the work of giants in conservation, like you. We look forward to the release of your new book and will gladly donate to the fund you have created in Julie's name. John.....Right now I cannot stop crying. 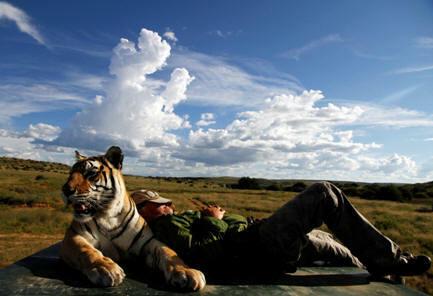 I saw the program Tiger Man a few nights ago on National Geographic Wild. I could see she was getting better after her episode with Shadow. I was so happy to see her. Did her loss of fluids cause the kidney failure or just her time to say good by? How do we recover from such a love as Julie? I am so sorry. South Africa has lost 2 wonderful beings. I remember getting out of the car and sitting next to Julie. It was an amazing experience. I can only imagine your loss. Sadly, the Princess of Tigers at Tiger Canyons passed away naturally at Tiger Canyons in S. Africa. Jan walked with Julie with John Varty's help when we visited in 2010. Jan's words: As far as I am concerned the greatest experience of my life excluding experiences with our relatives and children, was the walk with Julie. John was so careful to instruct me as to all my actions which resulted in a perfect encounter. That was one BIG animal. To be able to pace along with 4 big feet is a challenge in itself. Also Julie was rather vocal—she snorted, whined, and breathed audibly the whole time. Could that have been part of my sounds also?!! Sitting by her as we all three went down on the ground was another unforgettable experience. Part of her tail and leg was touching mine. This was MY clue to remain motionless. I am so happy Stoney recorded the event photographically. It will never be forgotten. I am soooooooo terribly sad you have lost Julie, I read your emails avidly and send them to all my family who are all Tiger lovers of note.... this is soooooo soooo sad, I was worried from the last email that she was badly hurt by Shadow, she is and always will be a magnificent animal, there is only one of each of us and that includes animals, she truly is a beautiful creature, YOU are so lucky fortunate and incredibly blessed to be able to have relationships like this, they will last hundreds of years and affect everyone differently. God Bless You and don't stop what you are doing, it is very important work and every day you do this you are promoting animal survival in Africa, this legacy will last way beyond all of us. What an absolute tragedy, such a terrible loss for you, she was magnificent and I don't think there will ever be another like her, just like the great Nelson Mandela. To you John and all at Tiger Canyon, my sympathies. She was a true friend of yours and I am sure you will miss her for the rest of your life. Animals have a special place in our lives and their laws and lives are in most cases better regulated than ours. They become like our own offspring. I am saddened and cry with you! That you shared this planet with so wondrous a creature and friend is a gift truly shared by few! My condolences, I cannot imagine what the heartbreak must be after such a loss with such a special creature. The Creator of all has put feelings in every creature, not only in Man and this has been proven and shown throughout the animal kingdom. It is with a heavy heart that I write this email. Tigress Julie was a huge inspiration in my wax paintings. I followed your stories from the time Julie & Ron arrived at Tiger Canyons. Unfortunately, I did not have the priviledge of meeting or seeing Julie in real life but she most certainly grew in my heart and as you mentioned became an icon in the tiger world. John..... How r u doing. My heart goes out to u. Live in peace.